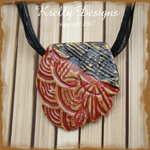 You will love wearing this Krelly, One of a Kind Art Piece. Most are between 1-2 inches in size. 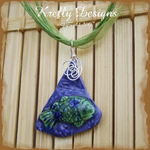 These Unique fused glass pendants are handcrafted and Artistically Wirewrapped with Non-Tarnishing wire. 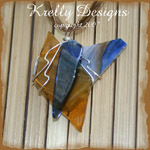 Each one is hung on a ribbon necklace with a matching adjustable dangle piece in the back. 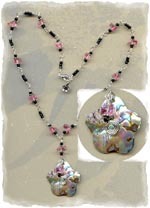 They can be worn as is or put on your favorite chain or necklace. 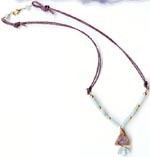 This pendant's colors are blue, gold, brown, and the wire is silver color. 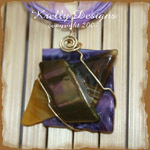 This pendant's colors are purple, bronze & gold, and the wire is gold color. 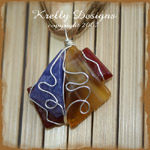 This pendant's colors are red, gold & blue, and the wire is silver color. 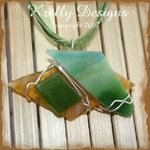 This pendant's colors are green & gold, and the wire is silver color. 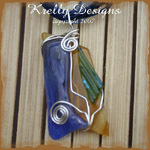 This pendant's colors are blue, aqua & gold, and the wire is silver color. 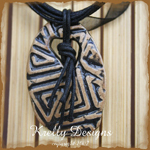 These Unique ceramic pendants are handcrafted of clay, fired and glazed by Kelly. Each one is hung on a ribbon necklace with a matching adjustable dangle piece in the back.They can be worn as is or put on your favorite chain or necklace. 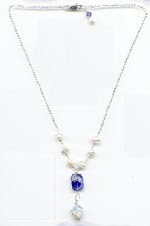 This necklace is blue & green with a silver color clasp. This necklace is red & black with a silver color clasp. 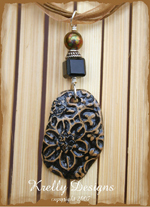 This necklace is brown & black with a silver color clasp.